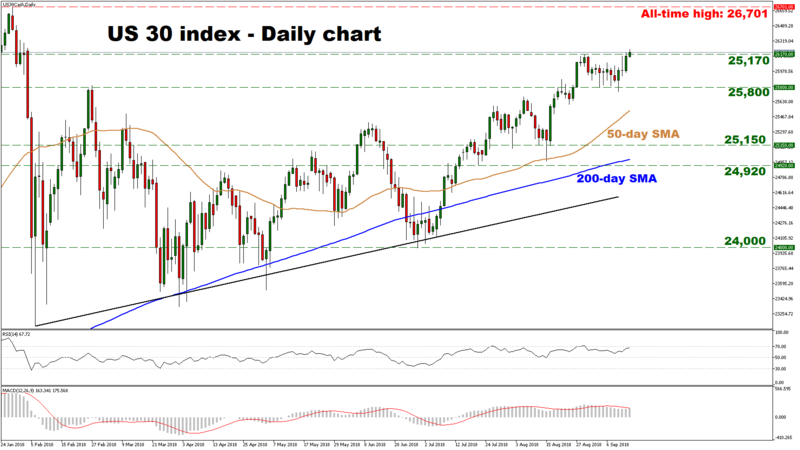 The US 30 index continued to advance in recent weeks, posting higher highs and higher lows on the daily chart while remaining above both its 50- and 200-day simple moving averages, which are positively aligned in support of a bullish outlook. 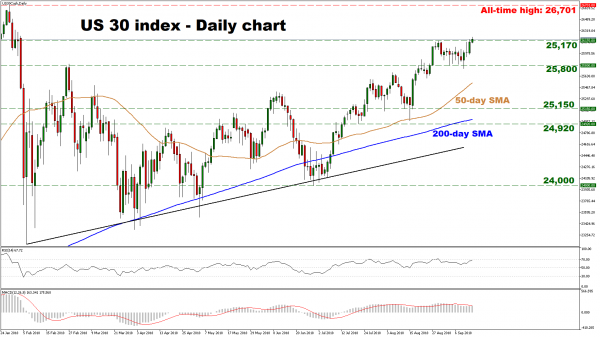 The index is also trading above a medium-term uptrend line drawn from the lows of February 6, and having recovered nearly all of its early-February losses, now appears to be headed for a test of its all-time highs. The RSI, already above its neutral 50 level, looks to be flatlining near its overbought 70 line. Note, that the RSI has failed to hold above 70 since late-January, which implies a short-term pullback shouldn’t be ruled out before the potential next leg higher. Meanwhile the MACD – already positive – stands fractionally below its red trigger line. Further advances in the index could encounter resistance at the all-time high of 26,701. If the bulls pierce above it, that would bring prices into uncharted waters, with the next barrier to offer resistance likely being the round figure of 27,000 and then 28,000, which may hold some psychological importance. On the downside, a slip below 25,170, the peak of August 29 could see scope for a test of 25,800, an area that halted several declines during the September 4 – 11 period. Stronger bearish moves may stall around the 50-day moving average located at 25,538 at the time of writing, before the 25,150 zone comes into view, this being the low of August 13. Even lower, the attention would increasingly turn to 24,920, the July 20 trough. In general, both the short- and medium-term outlooks for the index remain broadly positive overall, though take note that the RSI suggests a near-term pullback may be on the cards.